Friends are asking me for advice on their holiday party outfits and I say Sequins and glitter. Christmas and glitter go together like, umm.. Christmas and glitter. I decorated my house and put my tree up weeks ago - there's glitter everywhere. My poor little puppy has glitter in his fur! He also spent the first few days licking glitter off the glitter embellished wrapping paper. Umm.. you can imagine. The holiday season is the perfect opportunity to throw on some sequins, wear red (I never wear red), and go way overboard with your makeup. This is the time shine (insert wink). I do suggest you don a sequin dress or glittery shoes to your parties, but there's also some unconventional sequin styles out there for everyday wear. Ports 1961 black and army green oversized wool sweater (available at Farfetch) is a 'sequin statement'. LOVE. 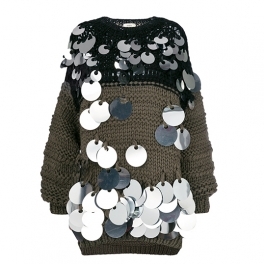 This oversized sequin embellished sweater is perfect for a day event. Paired with fitted jeans and booties, this look is festive and 'really' unique. My girlfriend wore these sequin embellished boots while we were in Vegas and she rocked it. They're loud and fabulous (maybe not for everyone). Her look inspired me to post some glitter on the blog. Steve Madden's take on the Saint Laurent Niki over-the-knee crystal boots is perfect for the rest of us that can't afford $10,000 boots. The crystal embellished textile of these Crushing boots by Steve Madden will add a little festive sparkle to your look. Pair these with fitted jeans and an oversized wool sweater for the perfect holiday season day look. Fashionable backpacks are having a moment. This holiday season pair your party dress with a small, glittery backpack. You can dance, wave your arms around like crazy and your stuff is tucked safely away in your stylish backpack. 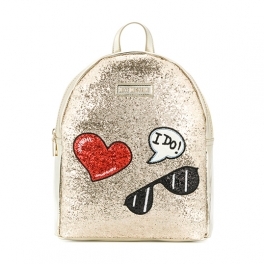 This gold-tone glitter backpack by Love Mochino (available at Farfetch) is the perfect party accessory. 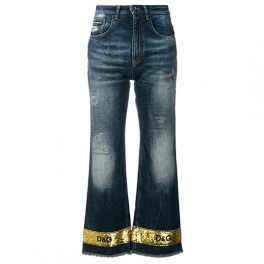 I'm obsessed with these jeans - Dolce & Gabbana sequin hem cropped flare jeans (available at Farfetch) are casually chic. The gold-tone sequin hem contrasts the dark blue shade and paired with the distressed edge - this style says 'I'm trendy, I'm sparkly and I'm just down right f**kin' cool'.